Although the war in Iraq has not been a great focus of EphBlog (examples to the contrary here and here), it is my favorite example of a topic in which the public conversation at Williams is ludicrously one-sided. 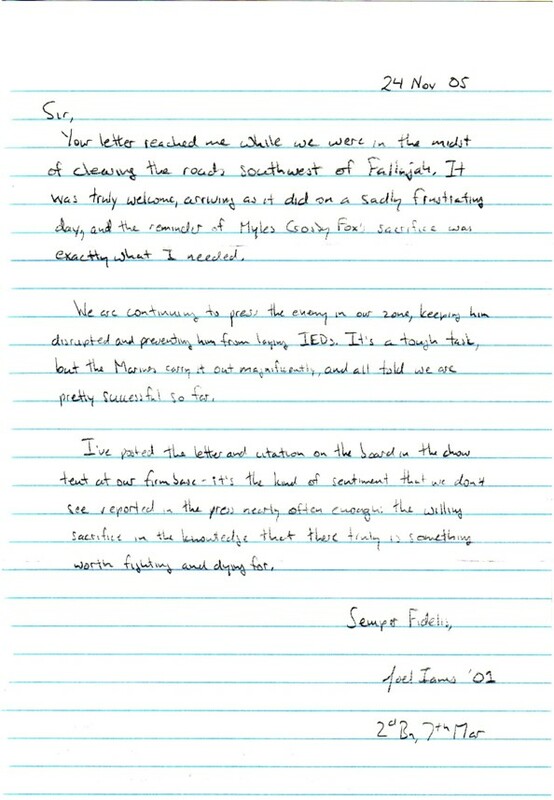 As a partial corrective, EphBlog is pleased to provide this update from Joel Iams ’01, a Marine First Lieutenant fighting the good fight in Fallujah. Now, if I were just a right-wing agitator, I would segue into a discussion of the Williams faculty. How many of our professors, post-modern products of the academy that they are, believe that there “truly is something worth fighting and dying for,” either in Iraq and Afghanistan (or in Kosovo and Darfur)? But such hackery is not today’s topic. After all, reading Professors like Sam Crane and Marc Lynch there can be no doubt that they are men like Iams, filled with a love of life and devotion to those around them. Indeed, since blogging is a window on one’s soul, it is clear that Lynch and Crane live, by word and deed, the sort of scholarly and family life that we might all aspire to. Instead, my argument today is with Williams, or rather the men and women who decide the Ephs that Williams chooses to honor, the winners each year of Bicententenial Medals. For the most part this Committe chooses wisely, although there are perhaps a preponderance of scribblers. To the extent that the Committee (and, by extension, Williams) thinks that there are things “worth fighting and dying for,” they should start honoring the Ephs doing the fighting. I would like to see one Eph veteran of the current war honored each year. Who would disagree? Only 2 Ephs in Iraq Now ! I would disagree. If we’re into giving out Bicentennial Medals just for people’s jobs/vocations, how about one each year for an investment banker? You get a Bicentennial Medal for doing something unique and outstanding, and just showing up for work doesn’t count. (Yes, although it is dangerous and takes skill and courage, being a soldier is just a job). Now if an Eph serving in the military came up with a new form of fighting, was pre-eminent in military history, or invented a new form of battlefield awareness communications, then he or she should certainly be considered for a Medal. 1) There is a bit of a wink-wink aspect to this description. The College still manages to award lots of rich Ephs Bicentennial Medals. Now, it is true that rich people are often quite successful in their fields. But this isn’t always true. 2) There is also a fair amount of defining down the definition of “distinguished,” at least when it comes to younger Ephs. I am sure that Marisa Reddy Randazzo ’89 is a wonderful person, but her achievements are certainly no more distinguished that those of Ephs in combat. I guess that it all comes down to what we mean by “distinguished.” Perhaps you think that clearing IEDs from the roads of Fallujah is no more “distinguished” than buying/selling stocks. I disagree. I would have pegged you as more of a patriot than that . . . Interesting in and of itself, and also particularly relevant to Ephblog readers as it was founded by an Amherst alum — I imagine there are even fewer Jeffs in the armed services (or certainly not appreciably more) than their Eph counterparts. He would be an interesting guy to invite to campus to speak … and were he an Eph, I’d say worth of a bicentennial medal. I think that if someone does something particularly heroic or unusual or rises to a high rank in the military, they certainly would deserve a medal, but I think just by serving, while worthy of plaudits, doesn’t really distinguish something — after all, millions of Americans have served, so military service (again, while honorable and worthy of praise) doesn’t really — standing alone — serve as a distinguishing mark. I think the idea of these medals should be, someone who distinguished themselves in their chosen field, whatever that may be. By the way, Mike, you could just as easily apply Reagan’s words to Vietnam circa 1971 — actually, they are far more relevant and applicable than they are to the instant conflict, because it was a lot easier to identify and isolate the enemy faced by Reagan — Communism — than it is to identify and isolate terrorists. Moreover, I don’t think a lot of people were arguing that our cold-war policies were directly responsible for creating MORE communists, yet it’s a very credible argument (and I’d say a winning one) that our policy in Iraq has created legions more terrorists, and will continue to do so until we have a regime change. So the cost-benefit calculation was a lot simpler to make. Are you saying, by citing to this speech as somehow the end-and-and-be-all blanket statement that applies to any conflict in any era, that leaving Vietnam was a mistake? That’s kind of the Jean Schmidt approach — you know, anytime we don’t use military force, we are cowardly and weak. Sometimes force is appropriate, but sometimes refraining from military force is the more courageous action. I don’t think anyone is afraid that the terrorists are going to triumph over the US militarily — their weapons are creating enough hatred and bile aimed in the US direction that people are willing to sacrifice themselves to kill as many civilians as possible. And that’s impossible to ever completely stop using force alone — just ask Israel. I was more referring to the “Should Jesus have refused the cross” bit as simply some great rhetoric about the fact that some causes are worth dying from. But I agree with you that Reagan’s clarity of vision would have been extremely useful during the Vietnam War.